Find a list of Event Staffing Agency London. Temporary staff for your next event. Private and corporate event staffing agency in London. Specialising in small to medium sized home parties events and corporate events. 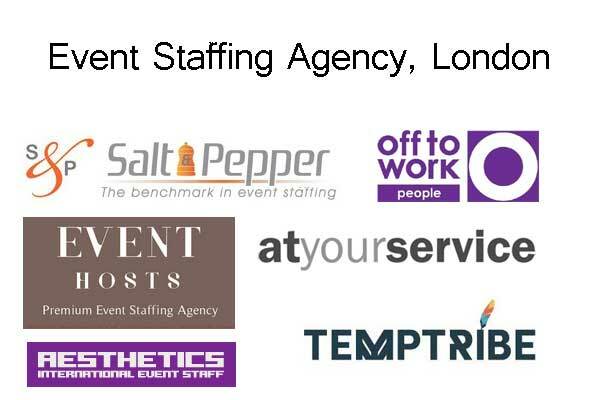 London-based temporary staffing agency providing hospitality staff, promo staff and crew to the events and hospitality industry. Premium Event Staffing Agency in London. Hire the highest quality Event Staff, Promo Girls & Promotional Models from Event Hosts. Event Hosts cater for all event types across the UK and in Europe. Leading event & hospitality staffing company, with offices and academies in London, Birmingham and Edinburgh. Supplier of high quality casual, contract and permanent staff, training and consultancy to the hospitality & events industry. Providing event staff, promotional teams, models and a full range of support services to the event industry. Offers private client staffing, staff for event catering, fixed venue bars, banqueting & fine dining, corporate hospitality etc. A multinational company. offices in New York City, Washington D.C., Long Island NY, Boston MA and in London England. Offers Elite catering staff for exclusive events in the U.K. and Ireland. London, SW6 2BW, England, United Kingdom. Hand-picked staff for every event. Brand Ambassadors, Entertainers, Event Staff, Exhibition Staff, Experiential Marketing, Hospitality & Catering Staff, Hosts & Hostesses, Models, Promo Girls, Promotional Staff, Sales Staff. A temporary event staff agency in London. It’s temporary positions service covers sectors including Retail, Product, Wholesale and Technical, Office Support, Buying and Merchandising. Catering, Hospitality & Private Events, Banqueting, Restaurants & Hotels. Exhibitions, Festivals & Sporting Events and Promotional & Marketing staffs. Run by catering and events professionals and offices in Birmingham and London. Offers Event Staff, Promo Staff, Hostesses in London and across the UK. One of the UK’s leading provider of recruitment solutions to the Hotel, Hospitality and Catering industry. Other offices in Manchester, Leeds, Bristol and Birmingham. Waiting Staff, Bar Staff, Supervisors & Managers, Chefs, Kitchen Porters, Room Attendants, Housekeeping Supervisors, Cleaners, Porters & Concierge, Reception & Sales Staff. Page updated : 27th November, 2017.